February 11th, 2013 09:20 PM | by Pasha | Uncategorized. As guide Dave Escamilla with Sparky’s Guide Service eased the big thirty foot striper boat out of the harbor at Alberta Creek Marina, the sky was full of gulls. Gulls, as far as the eye could see, dive bombing the surface of the lake, picking up hapless shad that were driven to the surface by greedy striper’s intent upon eating every baitfish they could catch. Winter approaches and Mother Nature somehow clues the stripers to once again feed heavily while the food supply is abundant. This phenomenon occurs about this time every year and it’s something that anyone that loves catching stripers, and lots of them, should not miss. Gulls begin arriving at Texoma in late September and by the end of October, their numbers are astounding. 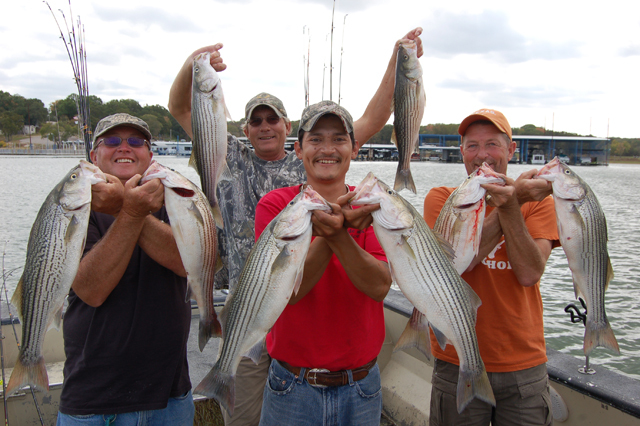 Striper fishing has been good at Texoma throughout the summer but it’s the fall and winter bite that attracts striper anglers from across the country to this great border lake that is shared by Texas and Oklahoma. Idle speed is required around all marinas and the slow pace leading from the marina to the open water was almost more than we could take. Larry Sparks, owner of Sparkys Guide Service, decided to take a guide’s holiday and invite me up to enjoy some of this fast paced catching with him and let his top guide, nicknamed “Little Dave,” run the boat and be our guide for the afternoon. “We will be fishing with 5 inch Glo Shim-Me Shad soft plastic bodies on 1.5 ounce jig heads,” says Sparks as we motor toward the first school of feeding stripers, not 300 yards out from the mouth of the harbor. “We dip the tails of these shad bodies in a product called Spike It Garlic Dip-N-Glo. This combination has proven to be the most effect of baits this time of year and will remain so throughout the winter. There were at least 300 gulls dive bombing the surface all around the boat and the water was occasionally dimpled with shad attempting to fly in efforts to evade the greedy stripers. “Don’t cast, just drop the baits down until you make contact with bottom and crank them up slowly about 20 feet. If you don’t get a strike, put the reel in free spool and drop them to bottom again.” My bait never made it to bottom. I felt the line go slack as the lure fell. Frantically, I cranked the reel handle and raised the rod in hopes of getting the hook set. The line was slack but, with taunt line, I felt another fish hit the bait, hard! As I did battle with my first striper of the day, I noted my companions were all locked in mortal combat. This was definitely not complicated fishing. The name of this game was to get the baits down close to bottom and keep slack out of the line so that the strikes could be felt. For about 10 minutes, the strikes were continuous. At time of catching such as this, it’s sheer pandemonium. I boated several fish and forced myself to set the rod down in time to grab my Nikon and capture Dave netting the biggest striper of the day for Sparks. “Roll them in, boys,” instructed Dave. “It’s time to move, this school has passed under the boat. Just look at that huge flock of gulls just off the point over there.” As I glanced in the direction the guide was pointing, it was easy to see where the fish were. It appeared as though every gull from the Texas coast was working an area a couple hundred yards square. Baitfish were popping out of the water and stripers had the surface churning. As Dave motored us within casting range, I heaved my big bait out on a long cast, raised the rod tip and began dancing the lure back toward the boat, just a few feet under the surface. The shad imitations lure didn’t make it far before it was slammed hard by a striper. Again, every angler on the boat was either hooked fast to a striper, or voicing displeasure over missing a good strike. There was little time to cry over the one that got away. It was only seconds until another greedy striper whacked out baits. Just a couple days off this rod bending fishing trip, I find myself making plans for round two with Texoma’s schooling stripers. According to Sparks, I can expect the action to be as good as or better than this most recent trip. “As good” will suffice. I cannot imagine better! 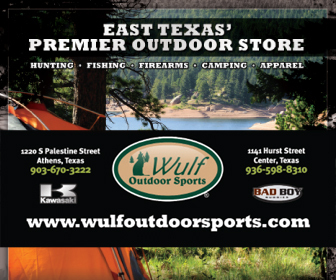 Lake Texoma makes an excellent winter getaway for East Texas fishermen. 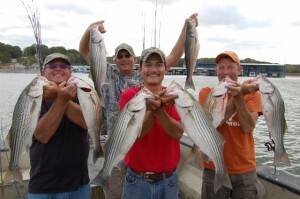 The lake is teeming with hard fighting stripers and winter is a great time to catch the big ones!